Make it obvious where your vehicle will be left or where you’ll be dropped off. Write your license plate, make, model and colour of your vehicle at this spot. Put the date. This information should also be included as part of your detailed trip plan, but it doesn’t hurt to have it in both locations. 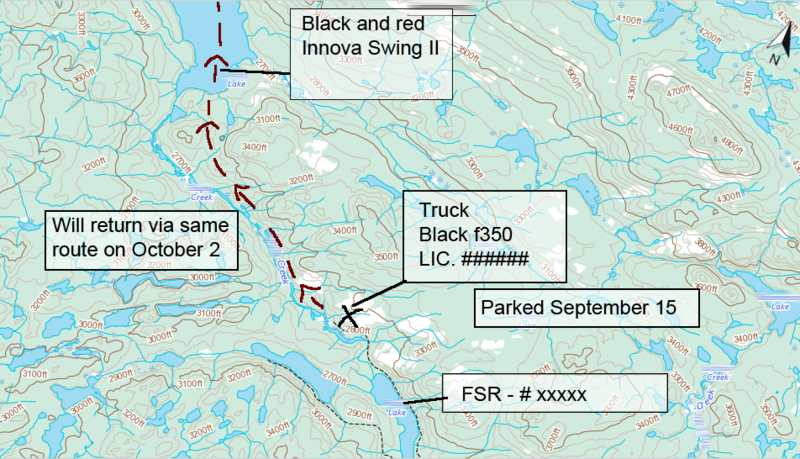 Make sure the FSR (forestry service road) is clearly labeled. Mark your planned trip path and alternatives if they may be necessary for whatever reason. If you’ll be on water, take note of the type and colour of your boat, canoe, kayak, etc. If the area is unscouted and you don’t know the exact locations you’ll be camping, circle the area you plan on spending most of your time. These sites should match the description of activities in your trip plan. If you’ll be exiting where you started, mark the path of your return along with dates. If you’re going to exit elsewhere, make it clear and include transportation information. There is no wrong way, as long as it is made clear where you’ll be and when. Colour and line styling can help clarify intent for others. Dotted lines for travel routes, circled camp areas and Xs for points of interest you’d like to check out, can all help others understand your plan. Also, don’t be shy about attaching notes that are in addition to your detailed trip plan.